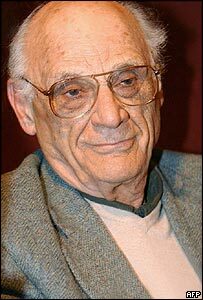 Theatres on Broadway have darkened in tribute to Arthur Miller, the American regarded as one of the greatest dramatists of the last century. The author of Death of a Salesman died at 89 of heart failure on Thursday evening, surrounded by family and friends at his home in Connecticut. Tributes have flooded in for the man who was once Marilyn Monroe's husband. "He had such a great life that you don't feel sad for Arthur," said renowned Broadway actress Zoe Caldwell. In his final decades, Miller grew disillusioned with the New York district at the heart of the US theatre world, describing it in 1991 as a place in "open terror of the critics and of losing fortunes of money". But there was mourning on Broadway on Friday, where houses went dark at 2000 (0100 GMT). Robert Whitehead, a Broadway producer who often worked with Miller, told the New York Times that the author of The Crucible and All My Sons had sought to be "a light onto the world". "He spent his life seeking answers to what he saw around him as a world of injustice," said Whitehead. It was a life which had seen the Wall Street Crash, World War II and the McCarthy era, and the great events of American history passed into the plays. "He was a big man and a deeply American man," added Caldwell, who also worked with Miller. He had, she said, been "busy working on plays right until he got sick". The playwright had also suffered from cancer and pneumonia. His death in Roxbury, Connecticut, was announced on Friday by an assistant. 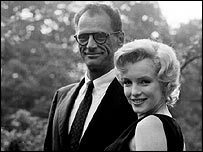 Miller bought an 18th-century farmhouse there in 1958 while married to Monroe and he spent his final years there with his 34-year-old girlfriend, the painter Agnes Barley. Doctors released him from hospital only a few weeks ago. "It took him a great effort to get here," his son Robert Miller told Reuters news agency. "This is where he wanted to be." Salman Rushdie, president of international writers' association Pen: "Writing meant, for him, an effort to locate in the human species a counterforce to the randomness of victimisation"
Vaclav Havel, Czech playwright and politician: "The greatest playwright of the 20th century"
Edward Albee, US playwright: "His work teaches us a lot about how to fight evil"
Kevin Spacey, US actor: "Arthur Miller continued to examine American values and moral decay with extraordinary structure and riveting dialogue - right to his last months"
Todd Haimes, artistic director of New York's Roundabout Theatre: "He liked young directors to take a crack at his great plays"
Brian Dennehy, US actor: "He stretched himself out and lived his life as completely as anybody out there I've ever heard of."